The Indiana witness near Clinton who recently recalled a UFO incident from 1994 when a slow moving, triangle-shaped UFO moved low over a government installation while he was conducting security work, has named the Newport Chemical Depot as the site during an interview with Indiana MUFON Field Investigator Ned Delaney, in Case 66660 from the Mutual UFO Network (MUFON) witness reporting database. The witness stated that he was on patrol at the Newport Chemical Depot near Clinton, Indiana. The witness was working a midnight shift with a partner on a routine patrol of the perimeter fence line installation about 2 a.m. in September 1994 when the object was observed. “The size of that thing was huge. It was at least 300 to 350 feet in length and at least 125 to 150 feet wide on the tail end of its triangle shape. 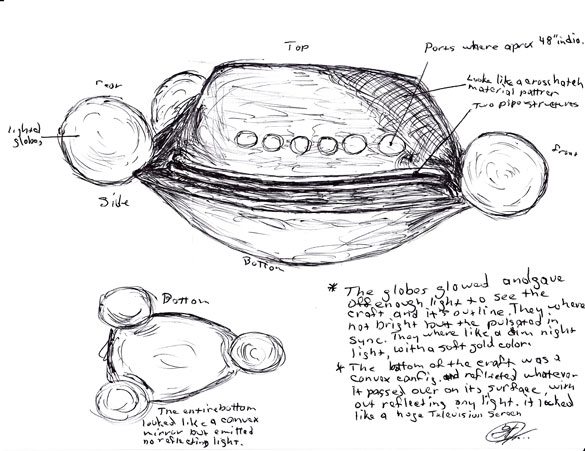 The top of the craft was not dome shaped, but it looked like it was a raised structure with portals along its sides, like the port holes in the side of a sailing ship. They were dimly lit and in a neat row close to the mid line of the craft. The bottom of the craft was like a giant convex mirror.” . . .
"Silent, Low Flying, Triangle-Shaped UFOs Move Overhead"